You have just been declared as “husband and wife” – it’s time to celebrate this new status. 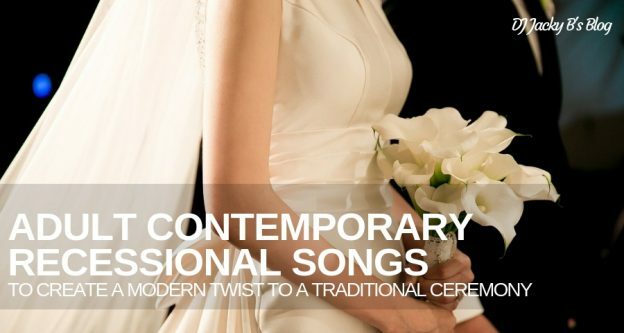 Put a twist to your wedding music by choosing contemporary recessional songs. When you get married inside a church or a house of worship, you might only be allowed to play Christian songs. If your wedding venue is secular, then you can get your wedding DJ to play a more modern song as you walk down that aisle as newlyweds. Your choice of song for the recessional should reflect this new stage of your life as a couple. Picking out a recessional song may be fun. It can also be challenging. Do you choose songs about your love story? Should it be songs that you both liked when you started dating? Or would it be better to choose songs that are currently popular? You don’t have to have voices in the songs to make them meaningful. Play the cover version of Bon Iver’s Holocene as performed by the Vitamin String Quartet. No vocals, just endearing music that effectively pulls at your heartstrings. Instruments are capable of considerably more emotion than you would expect. 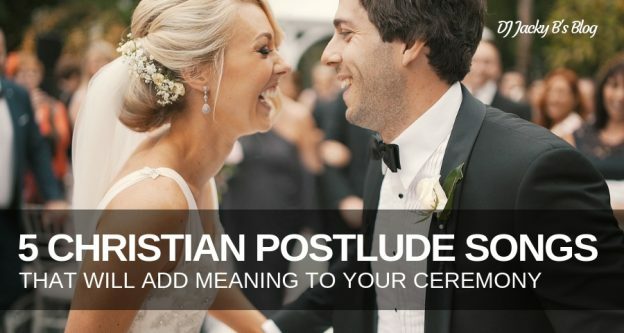 For a recessional, you can never go wrong with solemn and sincere. “The Prayer” by Andrea Bocelli and Celine Dion is one of the best choices. The lyrics of the song are congenial and uplifting. As the words are generic, you do not risk offending any sensibilities. The song goes, “Let this be our prayer… guide us with your grace.. give us faith so we’ll be safe..”. Performed by two of the most powerful singers in the world, this rich song will take your breath away. Take the time to choose your recessional music just as you would with all the other music that you are going to use during the wedding ceremony and at the reception. Make sure that you set the right mood for every stage of your wedding celebration with music that’s meaningful to you and your fiancé. 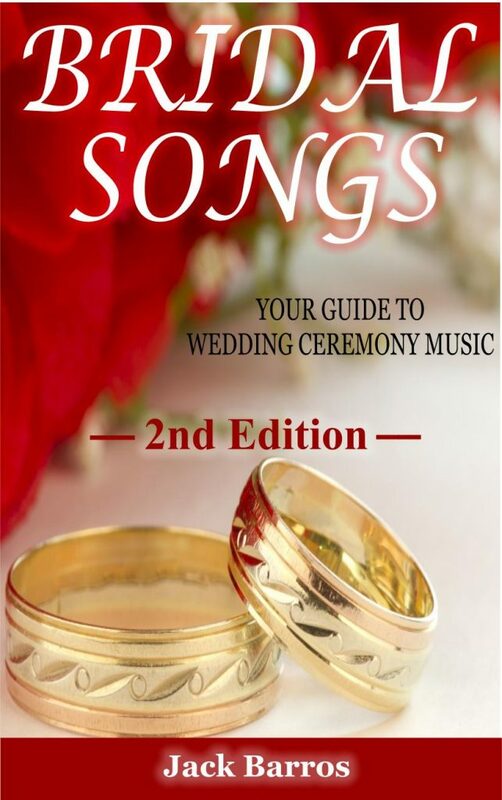 Check out my book, “Bridal Songs: Your Guide to Wedding Ceremony Music 2nd Edition” for more song selections for every part of your big day. Is there a song you would use for Adult Contemporary Wedding Ceremony? This entry was posted in Wedding ceremony music lists, Wedding DJ, Wedding Recessional, Wedding Songs and tagged Professional Wedding Emcee & DJ, Rock wedding songs, Wedding Ceremony Music, wedding DJ, wedding dj tips, wedding information, Wedding Music, wedding reception, wedding recessional songs, Wedding songs, Wedding Tip on November 23, 2018 by Jack Barros. The Wedding Ceremony Prelude marks the guest’s arrival to the wedding location. It typically starts around half an hour to an hour before the start of the wedding ceremony itself. The length of the prelude is determined by the number of guests so it’s best that you’re prepared well. The wedding starts when all the important guests have arrived. The prelude is also the best time to set the mood for the entire event, while the guests wait for the formal ceremonies of the wedding to commence. Modern wedding coordinators tend to set a cheerful atmosphere during this period, but some people prefer a subdued tone which then creates an intimate, and more solemn mood for the wedding itself. Classical music brings with it a sense of grandness, but at the same time, it also lends a sense of sacredness– telling us that an important ceremony is happening. One of the more popular music genres to play during the prelude is jazz. It sets a light mood without being overpowering. When you play subtly upbeat music, guests tend to relax, laugh, and smile more. Michael Buble’s rendition of Crazy Little Called Love is clear proof that this crooner can cover any song and make it truly his own. This song has been covered by many other greats, such as Elvis Presley and Queen, but Michael’s unique and soothing voice has managed to make it new again. The lyrics of the song talks about the ups and downs of love, quite perfect for a wedding. Kenny G is one of those artists who has managed to show the world that lyrics is not really a requirement for music to be fully enjoyed. With the power of his clarinet, he wooed people around the globe and gained worldwide recognition. One of his most recognizable piece of work and most heard during weddings is Forever in Love. This piece is light and can set the mood just right during the prelude. Another jazz master, Louis Armstrong, left us with so many great songs. Honeysuckle Rose is a song about how sweet love can be. It’s a less formal approach by comparing kisses to honey and the words work well together. Michael Buble gets another number in this playlist with his version of the classic How Sweet It Is. This song is another staple during weddings and one that it sure to get the guests singing along because of the light, familiar lyrics. If you want to inject some jazz music into your prelude song playlist, you can’t go wrong with these five pieces. 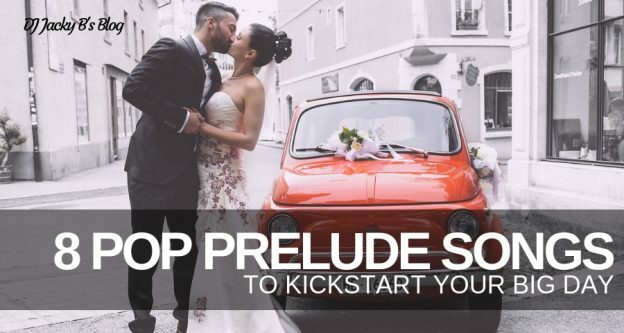 Want more jazz wedding recessional songs? Grab your copy of Bridal Songs Your Guide to Wedding Ceremony Music 2nd Edition a one of a kind wedding ceremony music resource! Find the perfect song for your wedding celebration. This entry was posted in Professional Wedding DJ, Wedding ceremony music lists, Wedding Prelude, Wedding Songs and tagged boston wedding dj, brides wedding tips, Jazz Wedding Prelude Songs, wedding ceremony, Wedding Ceremony Prelude, Wedding songs on September 17, 2018 by Jack Barros. Traditional wedding ceremony processional songs are songs that are not classical but have been used for sometimes generations as wedding songs. They may have been ‘adult contemporary at the time they were written and have faded from public eye. Many of the songs on this list are from movies through the years. 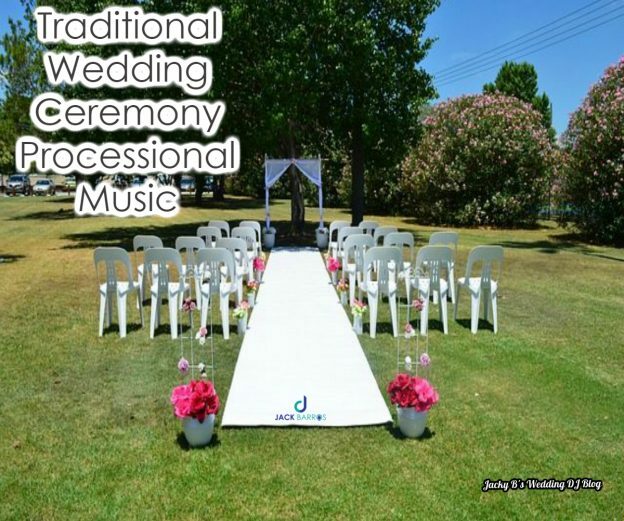 These are all songs that have been used or suggested to use as traditional wedding ceremony processional songs. Are you thinking of having a traditional wedding ceremony? Here are a few suggestions to help you get your creative juices flowing. Laugh, my dreams, and sigh! As you can see many brides choose to use instrumentals for their traditional wedding ceremony processional songs. This entry was posted in Wedding Ceremony Music, Wedding ceremony music lists, Wedding Information and tagged boston area wedding dj, central mass wedding dj, new england wedding dj, Professional Wedding Emcee & DJ, Traditional wedding ceremony processional songs, Wedding Ceremony Music, Wedding Music, wedding processional, Wedding songs, worcester wedding dj on October 13, 2017 by Jack Barros.